In essence the process is as follows: cook the rice, cool the rice, mix the rice with the yeast, cover and store in a warm place for 24 hours. If all goes according to plan, the sweet rice will begin to ferment and produce rice wine, which is like a sweeter version of sake. The number one enemy of this recipe is grease of any kind. 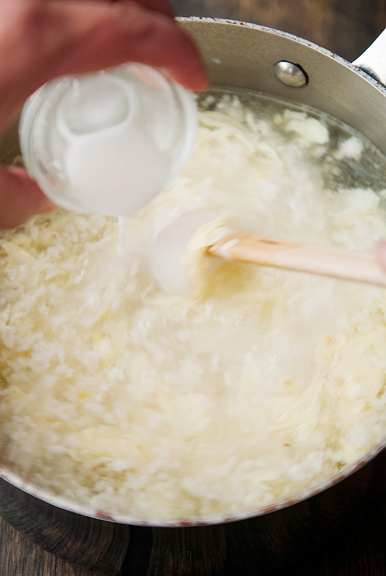 Much in the way that the slightest presence of grease can put the kibosh on whipping egg whites into meringue, any amount of grease will result in a giant batch of molded rice. To avoid such a major downer (sweet rice ain’t cheap! ), be sure to thoroughly wash all utensils and equipment – anything that the rice and yeast will touch – with soap and very hot water. I washed it all: strainers, rice cooker bowl, multiple bowls (for rinsing and mixing), mortar and pestle, the sink, the counters. I set clean dish towels out on my work surfaces. After soaking the rice overnight, Mom steamed her rice in batches using a big steam basket lined with a double layer of cheese cloth and steamer (remember, all of these components must be super clean). That’s the traditional way to do it. You have to work in batches. I have the instructions listed in the recipe. I went with a more modern method as outlined in this great tutorial. I used my rice cooker and didn’t need to soak the rice beforehand. My grains wound up being a little softer than the grains my mom had steamed. I think in the future I’ll use less water (I followed the Zojirushi guidelines), but they were still fine to use. This quantity of rice required three batches in my rice cooker. Once the rice is done, run it under cold water until it is no longer warm to the touch. The goal is to stop the cooking process. Strain the rice and place it in a large, wide, clean bowl. All of the rinsing and cooking and more rinsing requires a good bit of water, just FYI. 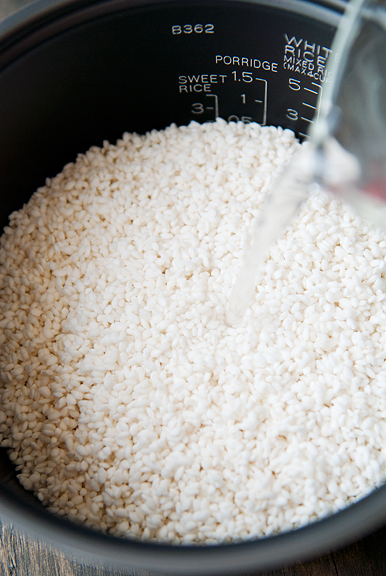 When all of the rice has been processed and placed in a large bowl, it’s time to add the yeast. 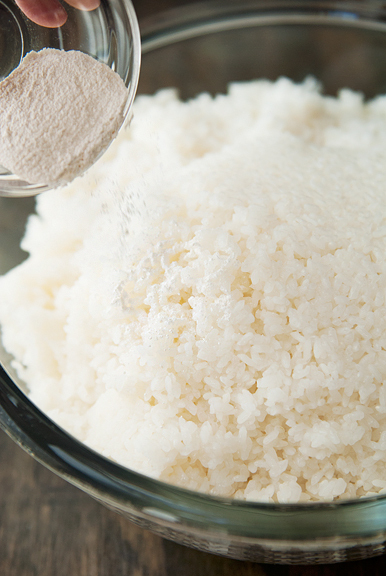 Sprinkle half of the powdered yeast over the rice and mix it together with your hand. Use a clean hand or use a gloved hand, whatever you prefer. Just be sure to distribute the yeast as evenly throughout the rice as possible. Sprinkle the rest of the yeast and mix it again. Pack the rice down and make a well in the center of the bowl all the way to the bottom. If all goes well, the hole should start to fill with rice wine in 24 hours. I covered my bowl with a sheet of plastic wrap and poked a couple of holes in the plastic to let gasses escape. I went to sleep with visions of molded rice and Chinese daughter failure projected onto the backs of my eyelids. What if it didn’t work? Could I have contaminated the rice during one of the hundreds (well, not hundreds, but it was a lot) of rinse and drain sessions? The next morning I snuck down to the office to check the bowl for mold. No mold! Also, no wine. Just sticky rice staring back at me. Everyone says to store the rice in a warm place for 24 hours, but warm is relative. Our house is pretty cold and I could not find a place over 65°F. Apparently, that temperature is just too low. So I popped it into the oven and turned on the oven light which keeps the temperature at a nice 80°F (I think 75-80 is a good range). That did the trick. The next day, the hole had filled with rice wine and the rice was floating about in the bowl. I was so happy. I jumped up and down in relief and celebration with no one but myself… and Grandma. I texted my mom that it worked. Mom says to let the rice ferment for 2 to 3 days, while others have said up to a week. I think you’re supposed to taste the fermented sweet rice to determine if it is sweet enough and winey enough. Of course, that’s hard to gauge if you’ve never had it before. If it is satisfactory, divvy it up into glass jars, tighten the lids, and refrigerate. The flavor will continue to develop, albeit very slowly, in the refrigerator. This stuff can last in the refrigerator for several months. So what do you do with it? My dad will chop a little up and add it to the sauce for his tofu fish recipe (super delicious), but the traditional way to enjoy it is in a sweet soup. 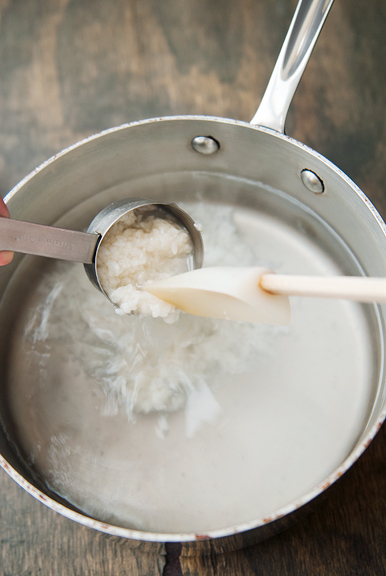 The simplest way is to heat some water, fermented sweet rice, and sugar in a pan and bring it to a boil. 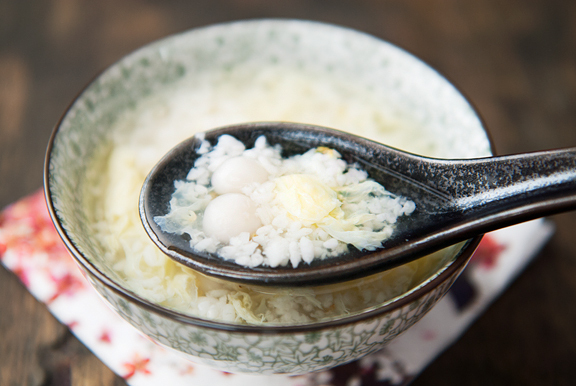 Other things you can add include glutinous rice balls (tang yuan) plain or filled, egg (as in egg drop soup style), and osmanthus flowers (gui hua). The osmanthus flowers can come in a sweet syrup in glass jars, but I couldn’t find any, so I settled for the dried flowers which smell like floral delicate dried apricots. 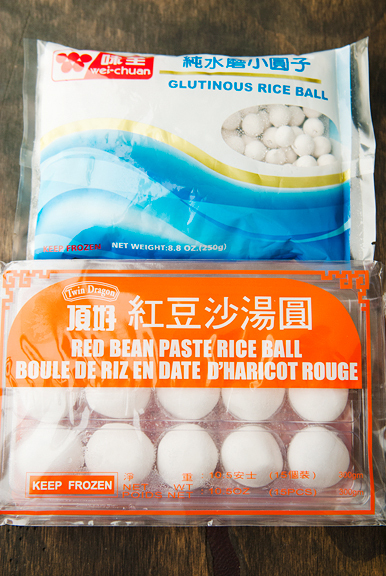 Plain glutinous rice balls are pretty simple to make (mix glutinous rice flour and water together to form a silky dough, then make little balls), but you can also get them in the frozen section of Asian grocery stores. That’s where I found the filled ones too, which I love. These cook up in no time, even if frozen. I plop them into the soup just as it starts boiling. The rice balls are done when they float. 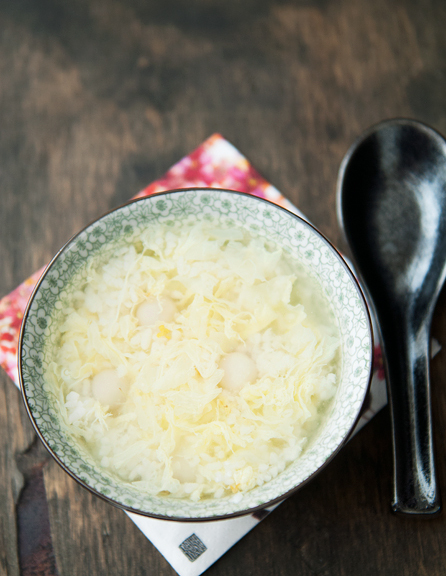 Stir beaten egg into the soup to make egg flower – just like you do with egg drop soup. I can take it or leave it, but I included the egg here so you can see the different options. And I like to thicken the soup with a little cornstarch, but that’s just personal preference. It’s just like what Grandma used to make, which is always a bit of a miracle to me. That moment when you finally achieve the magic that was created in your youth… it brings her back to me, binds me closer to my mother, makes me feel a little more connected to my heritage. That said, Jeremy is not a fan. He doesn’t like sake, which should have been my first clue. He’s never been able to muster much, if any, enthusiasm for the more traditional Chinese desserts. And that’s okay. He gets all of the creamy, chocolatey, western desserts. This recipe – this one comes from Grandma and Mom and me to you. Notes: I cannot stress enough how important it is to make sure all utensils, cheesecloth (if using), steamer (if using), vessels, strainers, hands, sink, mortar and pestle, etc. are absolutely clean and free of any grease. 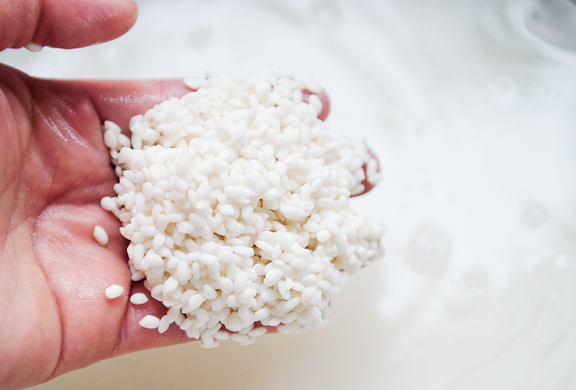 The presence of grease will cause your sweet rice to mold within 24 hours and render it inedible. So wash everything you are using carefully and thoroughly with extremely hot water before you start the process. 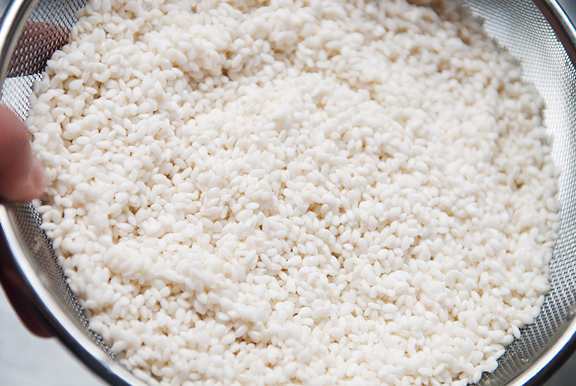 Prepare the rice: Rinse the rice in cold water and drain in a sieve. Repeat two more times for a total of three rinses (triple wash). You might have to do this in batches. That’s okay. 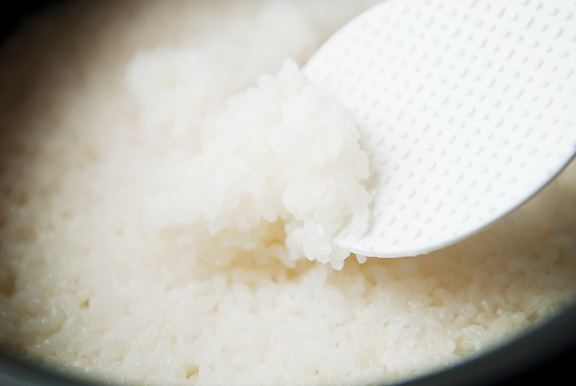 There are two methods to cook the sweet rice: a steamer (traditional) or a rice cooker (modern). 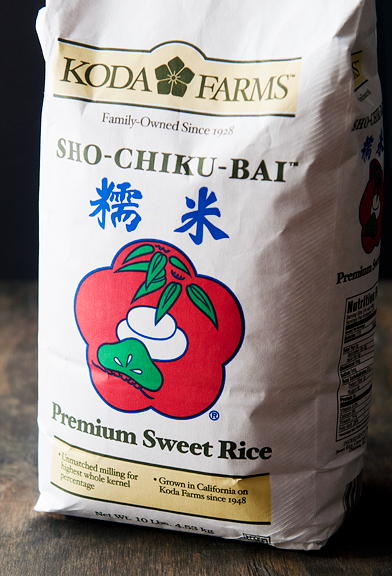 To steam the rice: Soak the grains overnight (12 hours) in enough cold water to cover the rice by 2-3 inches. Drain the rice, rinse, and drain again. Fill the bottom pot of a steamer set or a large pot or wok (that fits your steamer basket) a third full of water and bring the water to a boil. Line a large steamer basket (or two) with a double layer of clean cheesecloth that extends beyond the steamer basket (you want overhang so you don’t lose any grains). Evenly spread a 1/2-inch layer of rice over the cheesecloth. Don’t pile the rice on thicker than this or the grains may not steam all the way through. You can stack 2 layers of steamer baskets at a time over the boiling water, but most likely the rice will have to cook in 2 batches. Cover the top of the steamer basket with a tight fitting lid and steam for about 20 minutes (it may take longer). 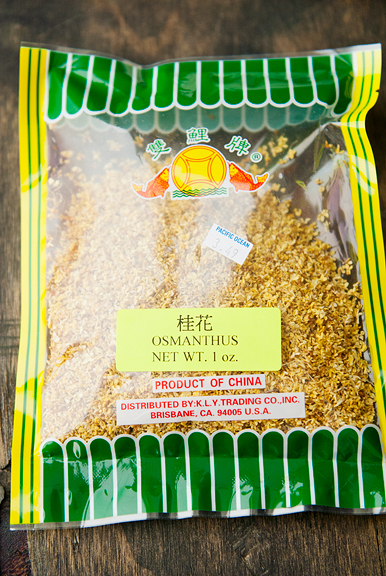 Check the grains to see if they are translucent, but not mushy. You don’t want any opaque bits (uncooked) in the centers either. When the rice is cooked, place all of the cooked grains into a large strainer and rinse thoroughly in very cold water until the rice no longer feels warm (we want to stop the cooking). Place the rice in a large, wide bowl. 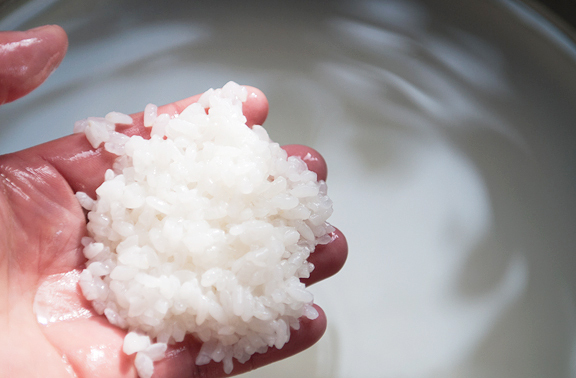 If you are cooking the rice in batches, check the water levels in your steamer base and get the remaining uncooked rice ready for the steamer and repeat. To cook the rice using a rice cooker: For this volume of rice, you will have to cook it in 2-3 batches. 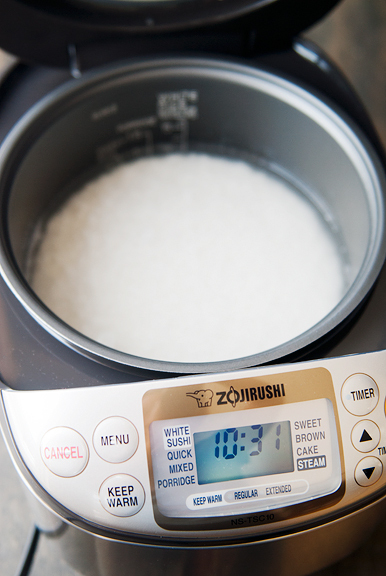 If using a modern rice cooker with a “sweet rice” setting, follow the manufacturer’s instructions for cooking the sweet rice. If using the older models of rice cookers, place 3 cups of rice and 2 1/2 cups of water in the cooker pan and set to cook. When the rice is cooked, place the cooked grains in a large strainer and rinse in very cold water until the rice is no longer warm (to stop the cooking). Place the rice in a large, wide bowl. Repeat for the subsequent batches. 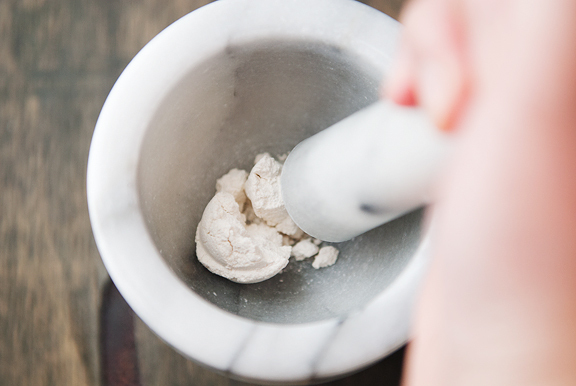 Begin fermentation: Crush the yeast ball into a powder using a mortar and pestle. Sprinkle half of the yeast evenly over the rice. 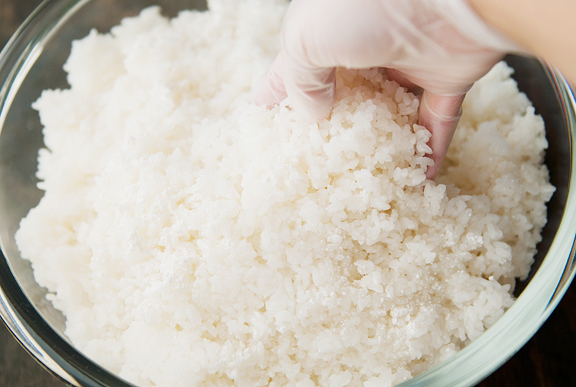 Using a gloved or very clean hand, mix the yeast into the rice to distribute the yeast as evenly as possible. 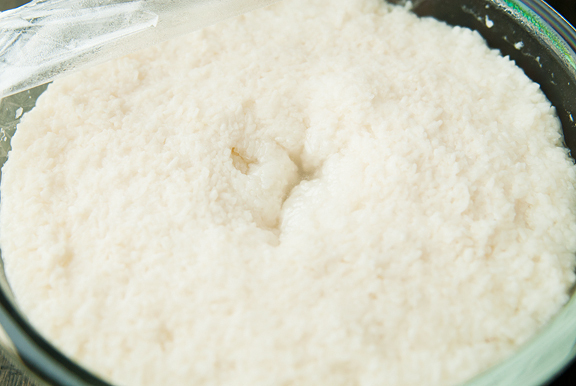 Sprinkle the remaining half of the yeast evenly over the rice and mix again. At this stage, you can press the rice into a large clean glass jar (large – like a gallon size is what I would use) or press it down into the large bowl (that’s what I did). Mom says to use a vessel with at least 20% headspace or else when the rice wine forms, it will overflow and make a mess. 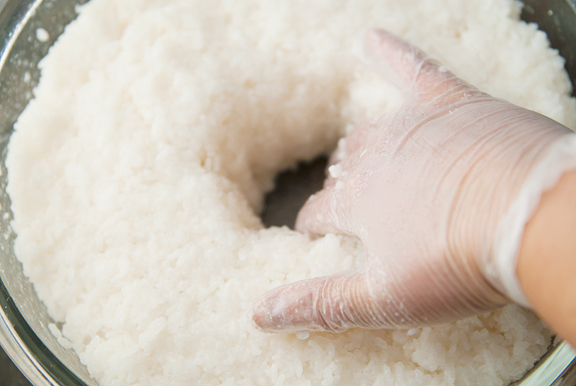 With your fingers, make a well in the center of the rice all the way to the bottom of the vessel. 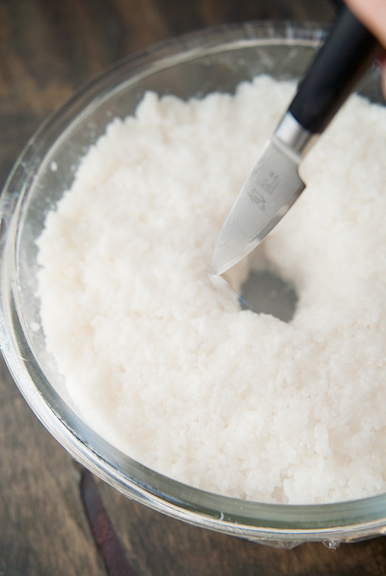 Cover the bowl or jar tightly with plastic wrap and poke a few air holes into the top with a sharp knife. Set the vessel in a warm (75°F-80°F), dry place for 24 hours. I found that my oven with the oven light turned on worked nicely. After 24 hours, there should be liquid (rice wine) starting to accumulate in the well and no mold. 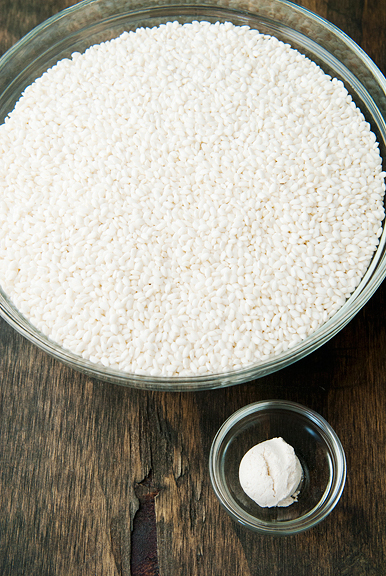 If the rice has molded, you’ll have to throw it out (sorry!). If the rice has not molded, then continue to let the rice ferment for another 24-48 hours in the warm place. The rice will begin floating as more rice wine is produced. It should smell like sake and taste sweet and slightly boozy. 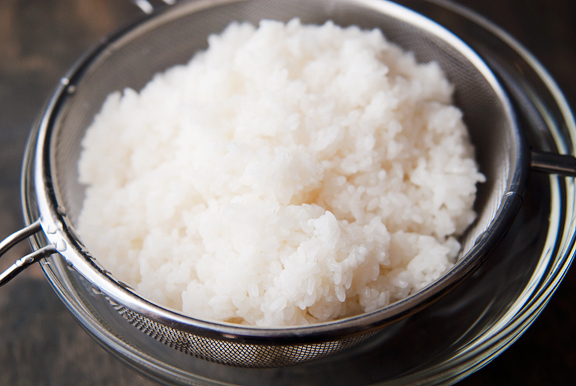 When the flavor is to your liking, divvy up the rice and liquid among smaller jars, seal, and refrigerate. It should be good for several months. Makes 3 quarts. 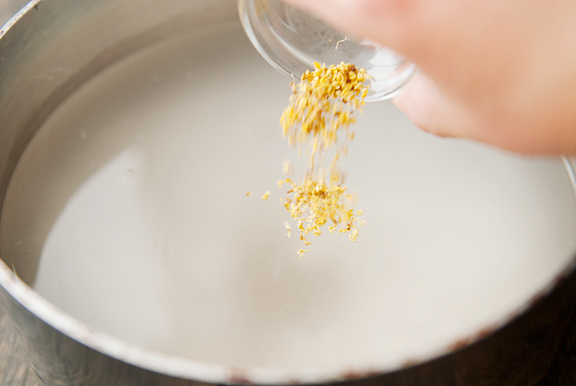 Place the Chinese fermented sweet rice, sugar, osmanthus flowers, and 6 cups of water in a medium saucepan. Bring to a boil over high heat. When the water is boiling, add the rice balls. When the rice balls float to the surface (about 3-4 minutes), stir the soup with a spoon and slowly pour the beaten egg in a steady stream into the soup. 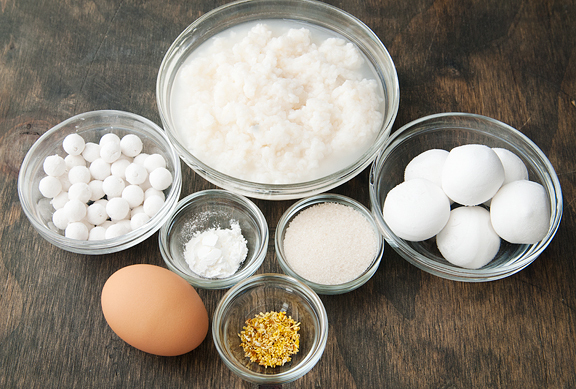 Mix the cornstarch with 2 tablespoons of water in a small bowl. 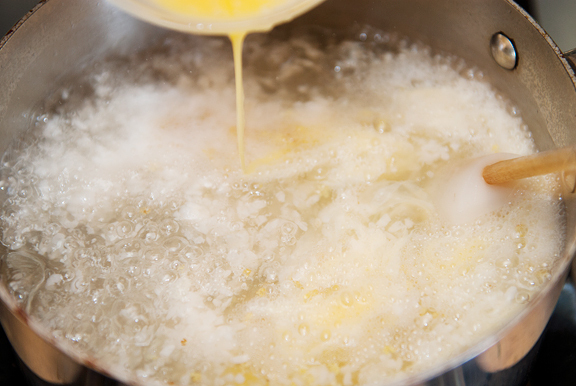 When the soup returns to a boil, stir the cornstarch mixture into the pan. When the soup thickens, turn off the heat and serve. Serves 4. I am not Chinese, and I’ve never had this, so I am fairly certain I won’t be making it, but I LOVED reading about it! You sat on the counter and pretended to be the neighbor’s dog? No wonder so many of us love you. I’m so glad that you wrote about your grandmother. Mine died in September at the age of 95. Her birthday is on the 21st, and I have been thinking about her even more often than usual…even though I still regularly think, “I need to call Grandma,” and then experience that awful stabbing feeling of loss yet again. Thank you so much for sharing. 1) For rinsing the cooked rice, can tap water be used or would quality be better using filtered water at any point of the recipe? 2) 3 Quarts will probably last us for year(s) – I’ve never had jiu niang straight before (only the resulting tong yuan recipes), can it be passed off as really sweet sake or other cooking purposes? 3) Is sweet rice the same type of rice as the glutinous rice flour used to make tong yuan? My Chinese is terrible. I miss some of my grandma’s cooking and wished when I was younger I had watched her cook more closely. I can however make spaghetti and meatballs perfectly thanks to her! I can’t believe your grandma passed away almost 4 years ago. I remember your post about her and it doesn’t seem that long ago. Time just goes by faster and faster….. Cannot conceive of making this but interesting to read. Thanks for posting. You were so lucky to have your grandma for so long. I met mine once when I was 5 and never saw her again. She seemed very old even then. My grandma makes the best Jiu Niang!!! i tried to make it before and found it’s really difficult to control the temperature, and mine wasn’t as sweet as hers. this is the comfort food we can eat. and the flavor and happiness it brought to us is more than the food itself. Love reading your post. it always bring a smile on my face. 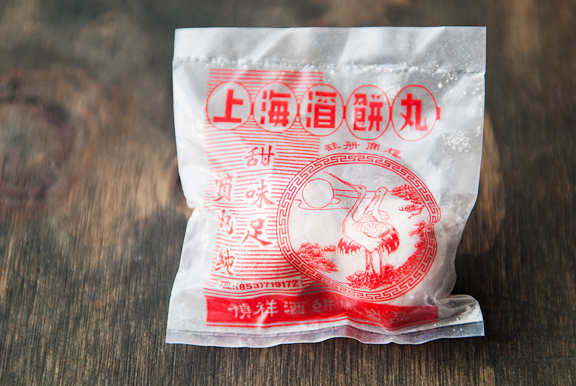 And by the way, i like to spoon the Jiu Niang straight from the jar and shovel it right into my mouth. yum!!! It’s also so great that you and your Grandma cooked together. My grandmother has all of these stories of stuff that her mother used to make that she never learned “because she always thought there’d be more time”, which is the saddest thing ever. I’m intrigued by this recipe, but I know that my partner would not like the texture of this, and I’m sure it’ll be much too much for one person that doesn’t know if they want it! Thank you for sharing it. Has it been 4 years already? **sand in saddle shoes** You make me smile. Such a sweet story with your Grandmother. Warmed my heart – thank you. This recipe looks very interesting. Sadly, I know I’ll never attempt to make it…who knows. But I appreicate the time and hard work it took just to write this. Amazing. Your memories of your grandmother warmed my heart. I’m glad your mom figured out the trick to this favorite of yours. I remember my grandmother making “pummelkins” for a special treat when we would come home from school. Big, yeasty donut holes is somewhat of a comparison. Grannie lived with us for a month or so, and then would go to her other daughters home for the same. I remember so much about her. Those tiny glasses, homemade bras, her baking, talking in German, and how she smelled. Anyway, when we asked for the pummelkin recipe, she wrote it down. 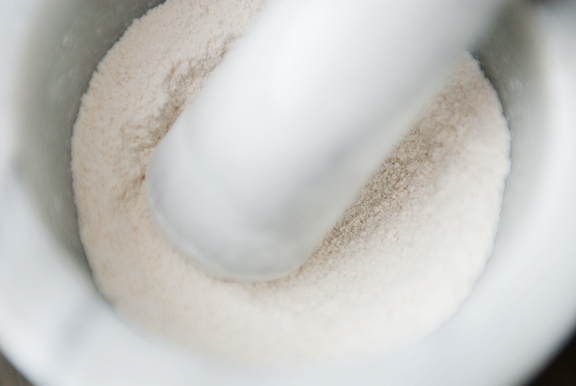 One package yeast, two scoop flour, one scoop sugar….wish we had those scoops now, for accuracy in the recipe! This was a lovely post to read, Jen. My grandmother and I don’t have quite such fond of memories (she’s not quite as kind), but there are some select moments where she’ll guide me to show me how to make vietnamese rice cakes (traditional for lunar festival). It’s a whole weekend process of cleaning banana leaves, soaking and draining the rice and mung beans, then the wrapping, packing, tying, and cooking process. Asian recipes take so much time to prepare, but it’s so so so worth it in the end. Thank you so much for sharing your jiu niang recipe! Wow! Authentic! My mom makes this as well. Really tasty and delicious, I must say. To my chagrin, I did not realize the amount of work and time it takes into making it nor the ingredients beyond the sweet rice and glutinous rice balls. I did not know about the other list of items, but it makes sense. I remember my days in graduate school. Some days were better than others, but I sure miss being in the lab doing experiments. Thanks for the links on the chinese new year recipes! debbie – it really feels like yesterday. Jie – me too!!! ha ha ha!!!! Tegan – that IS so sad. But hopefully we can learn from others and share these experiences together before our loved ones are gone xo If you want to “try” jiu nian before committing to making a batch, you can purchase a pint from an Asian grocery store (if they carry it – not all do). farmerpam – yes, sadly. Time flies. Linda – She dressed me up so nicely every morning before preschool and then I’d play in the sandbox and bring half of it home in my shoes. Claire – you’re so sweet :) Thanks! Oh. My. Word. Thank you for sharing this recipe and the keys to your trial and error! I’m so hoping I’ll be able to make this for the new year as it brings back memories of being with my mom and ah ma and making plain tang yuan to have with the jiu niang. Delicious! I am not chinese but am an adventuresome eater. I found jiu niang completely by accident. I bought a large electric pressure cooker that came with this recipe in the instructional manual. I thought that was unusual it was in the instruction manual and not the recipe book. I had never heard of jiu Niang but it looked like a sake recipe and I do like sake. I looked it up on the Internet and I found all these stories of people remembering it as children. So I tried the recipe and it workd very well. No mold. And I left it for 4 days then put it in the fridge where it continued to ferment actually. It is sweet but a fermented sweet. I have called it sake rice pudding.,I do not think it is very alcoholic but who knows. It must have a bit and then understood maybe why everyone remembered it as children from their grandmothers. Grandmothers are so wise. I have not tried the soup yet but will. I’m a Chinese from Singapore and am trying to make my own jiu niang these couple of days.May I know is it ok to use a clean spoon to mix the yeast with the cooked rice instead of mixing with the hand? Evelyn – yes, you can use a clean spoon or even a clean fork. My mom and grandma just felt it was more thorough to mix by hand. I think either way is fine. Good luck! We just made this in my food fermentation class at Ohio State University. I had never heard of it or eaten it, so I enjoyed learning about it. Your story is especially lovely and reading it made me happy. Thank you. thank you so much for the recipe – It turned out wonderful! When I separate into containers – do I pour off the wine from the rice – for drinking and cooking? I want to try a couple of the soup recipe but don’t want jeopardize making of the soup recipes. May I know the name of the shop where you get the rice yeast balls as many shops are not selling now. Julie – Hi there, I got mine at Pacific Ocean Market here in Colorado. Seeing as you may not be local, I checked on Amazon and was delighted to find if you do a search for Chinese rice wine starter, you’ll get a number of choices! Hope that helps! Tried the rice wine recipe but I would like to know why is it sour? Susan – if it’s really sour, it might be bad. It will have a little tang to it in the fermented sense, but it shouldn’t be sour like vinegar.